What I’m learning is that no matter how many times you make a recipe successfully, it can—and will—still fail. I’ve been carting my vegetarian caramel corn all over the Inland Northwest these last six months as Phil and I promoted Blue Moon Vegetarian, and not once has anyone turned up his or her nose. Phil and I have prepared batch after batch, until we never wanted to see another kernel of the yummy-but-not-so-bad-for-you treat. I am not exaggerating when I say I could make it in my sleep. In fact, during those weeks when we did three events on top of our jobs and creating new recipes for the cookbook, I’m pretty sure I did. For those who’ve been following this adventure for a while, you know that the first recipe from the memoir used butter and agave syrup. The stuff was SO delicious, and we were so glad to have found a treat that didn’t fiddle with Phil’s blood sugars. We gave up on butter when we went vegan and concurrently discovered the benefits and bliss of coconut oil. Not too long after, we learned to limit our use of agave for its purported affect on insulin receptors and the fact that it can—if improperly handled—contain botulism spores, which isn’t a problem for most of us, but is potentially for the younger grandchildren and pregnant women (certain sources contend botulism spores can bring about miscarriage). Somewhere in there, we came to understand the superior nutritional value of coconut sugar and to love the flavor and the way it performs in baked goods, rare as they may be in our house. So, for the past few months, we’ve switched out agave in all our recipes for coconut sugar, which translates to us making not Agave Caramel Corn, but Coconut Caramel Corn, which is much better for you and much more delectable. Unfortunately, this week, for some strange reason, the store-brand of organic coconut sugar didn’t melt into the oil. I don’t want to mention the name of the chain, but it’s one of those places people like me love—focus on organic and whole foods—and one that has been very selective about where it locates itself. I have a list of things I won’t buy under that brand name, and now I’ve added coconut sugar. Like so many things, it is a brand name that started out great, producing high-quality products, but has in recent years traded quality for quantity of stores and degrees of profit. My research on why this sugar might have failed led to my discovery this week that the harvesting of nectar from the coconut blossom means—of course—that no coconut will grow from siphoned blooms, so the world’s burgeoning consumption of coconut sugar is driving up the price of coconuts. You can’t win for losing. And then, of course, there is the rational deduction that no matter how nutritious a sweetener might be, it is still, after all, a sweetener, and still should not be prominent in your diet. Moral of the story, I’m still working on the Caramel Corn recipe. But I did manage to whip up an alarmingly good batch of International Day of Happiness Cookies (see http://www.paulamariecoomer.com/international-day-of-happiness/), which also looked a bit darker in this recipe than in previous versions, but still turned out beautifully, and if I do say so myself, quite delicious. 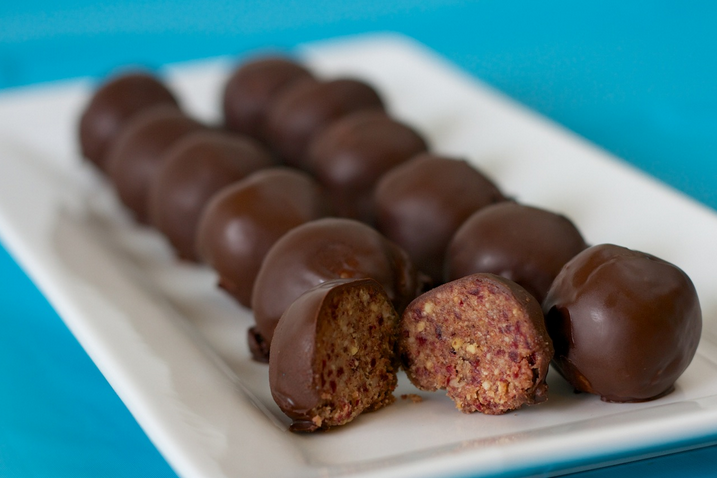 And then there were Cherry Power Balls, previously known in Blue Moon Vegetarian as Protein Balls. The new version uses rice syrup as a sweetener, but not very much, and juice-sweetened dried cherries. 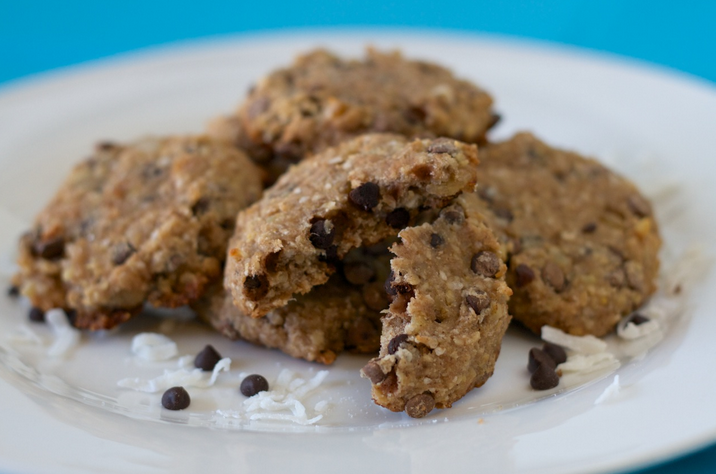 They are, frankly, swoon-worthy, but also pack a considerable protein punch, since they are spiked with hemp protein.